What is the white color material on the drawers? 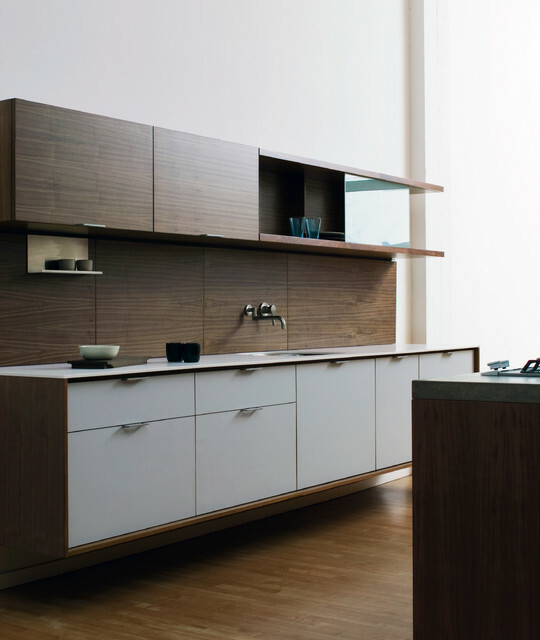 Floating kitchen cabinets - how unique and beautiful! I absolutely love this. Is there ever a concern for putting to much weight in/on them? Could you tell me who makes the faucet? Thanks for giving the thickness. I'm thinking of going ultra thin. Looks great! The pulls are Henrybuilt. Thanks for your interest! What is the make of the wall-mount faucet? May I know the dimension of each awning upper cabinet? - and the total length of the upper cabinet. Thank you. Wall mounted faucets work well in minimalist kitchens where the less ornament to distract from the simplified materials and shapes, the better. Shallow counter depths that don't leave clearance for the holes of a centermount faucet dictate the use of a wall mounted fixture. When those situations arise, make it look intentional and modern.